At Environ Associates, all factors of the outdoor environment are incorporated, not just plant selection and placement. 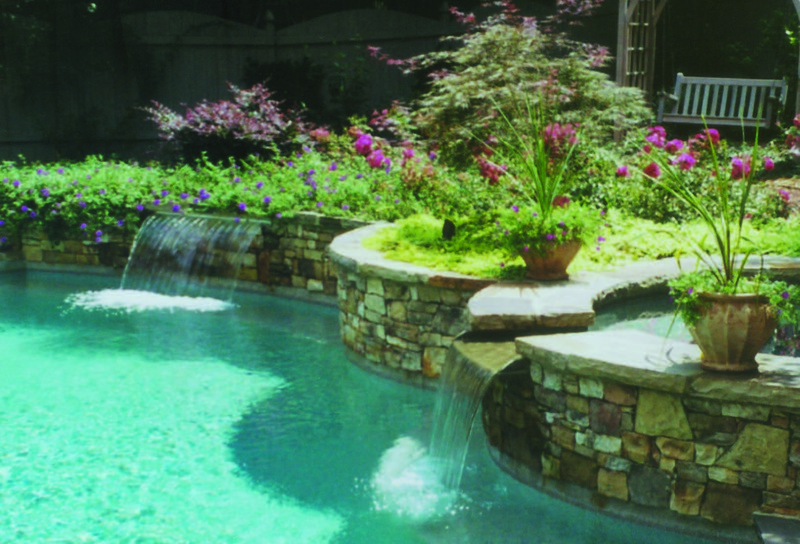 In addition to planting designs, many of our landscapes include retaining walls, driveway layouts, walkways and patios, wood structures, swimming pools and water features. Our professional design staff is prepared to address any challenge your site may provide and treat it in a most attractive and functional manner. The appearance and durability of any landscape depends upon quality construction. Our field personnel are professionally trained and recognize the needs of individual plant varieties along with the importance of proper plant placement. Environ Associates uses high quality plant and construction materials to provide you with a landscape aesthetically pleasing and enduring. To ensure the highest quality trees on our projects, we produce evergreen trees locally on our Forsyth County farm. We cultivate these trees for optimal appearance, growth and performance in your landscape. These larger trees make an instant impact and add scale to your project from the start. We would like to help you design and install your next project ! From complete landscape renovation to simple yard enhancements, we can help with your landscaping needs. Call us @ (770) 889-6000 or come by to see us and let us help you succeed with your next project.